Hard Rock Cafe built its first U.S. Vegetarian Awareness Month menu of eight new items—including a cauliflower burger—this October because “interest in meatless options has grown over time,” says Darryl Mickler, senior director of R&D. Besides getting meat-eating diners on board, Hard Rock set out to appeal to Gen Z and millennial customers with an Instagrammable dish. So the cruciferous patty features toppings beyond the basic lettuce, many of which the chain already had in-house. 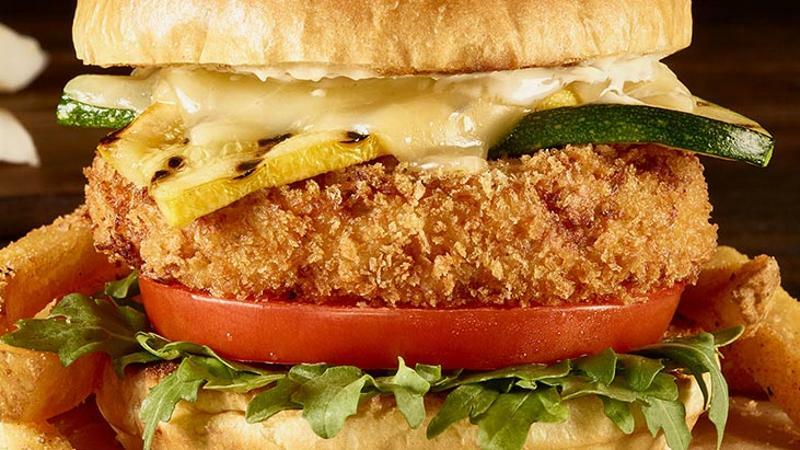 Mickler says the burger has taken orders away from the Veggie Leggie, the chain’s core veggie burger that features a premade patty with a mushroom, soy and rice base. The team is considering adding the cauliflower variation to the permanent menu in the future. Breaking away from the more commonplace grain- and black bean-based veggie burger, the LTO’s fried housemade patty combines ground cauliflower, egg, garlic, oregano, goat cheese and bread crumbs. Zucchini and yellow squash strips on top—also on the core veggie burger—lend color, as do the tomato and leafy arugula toppings. And a housemade aioli, served with the chain’s flatbread and fries, adds an upscale twist to ketchup.